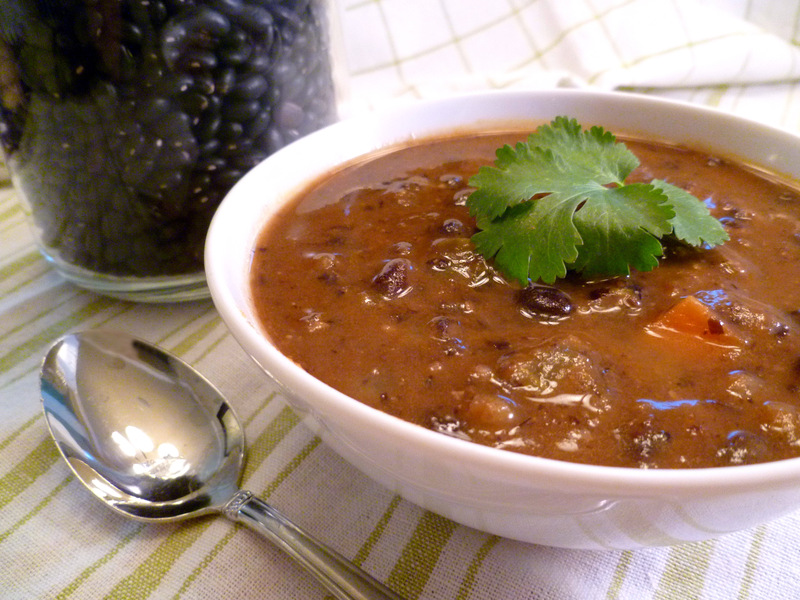 If using dried beans, soak, rinse and cook black beans until tender. If using canned, drain and rinse. In large dutch oven over medium heat, saute onion along with a pinch of kosher salt in olive oil for about 5-7 minutes or until tender and translucent. Add in celery, carrots, poblano or bell pepper and herbs. Saute another 5 minutes or so or until veggies are crisp tender. Add in tomato paste and saute about 2-3 minutes. The idea is to get the tomato paste to brown a bit on the bottom but not burn. Add in the sherry to deglaze, scraping the bottom of the pan. Add the black beans, broth and bay leaves. Bring to a boil, lower heat to a simmer. Cover and simmer for about 40 minutes or until veggies are all tender and flavors are melded. Turn off heat and remove bay leaves. With an immersion blender, puree about 2/3 of the soup. Taste for salt and add as needed (see footnote). Turn heat back to low and let simmer another 5-10 minutes. Serve with cilantro and vegan sour cream. Footnote: Feel free to add another 1/4 cup of sherry or teaspoon of cumin. The flavor can be enhanced quite a bit more with either of these ingredients. This sounds like the perfect winter comfort food, and as I’ve never used black beans before I will definitely try this soon! Thanks! Nice! I just made beans and tri-color pasta for the week. I’ve been looking for something a bit more lively for this time of year, haha. Thanks! Another family favorite! David wants me to cook this again! Toni, you’re just making my days! I love it! Thanks so much for letting me know!